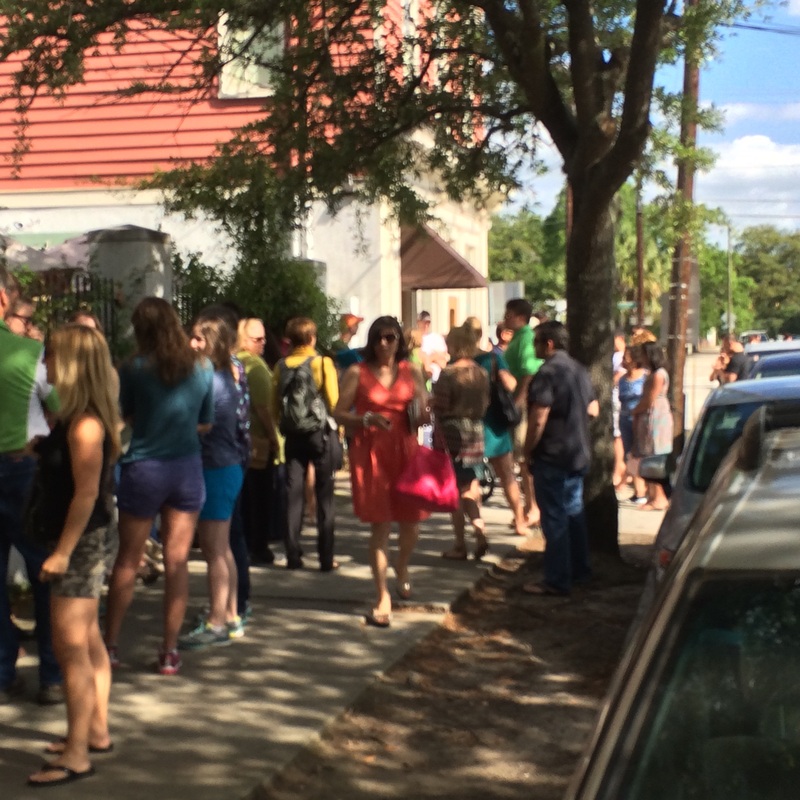 Weekend Trip to Charleston, SC – A Culinary Adventure | Let's Eat! My wife and I recently took a weekend trip to Charleston, SC. Charleston is one of our favorite cities to visit. It’s rich in culture and has an amazing food scene. It seems like we ate our way through the entire city!! This was only a two-day trip but we packed it with great food and sight-seeing! We managed to get a quick trip to the beach and some time by the pool as well! 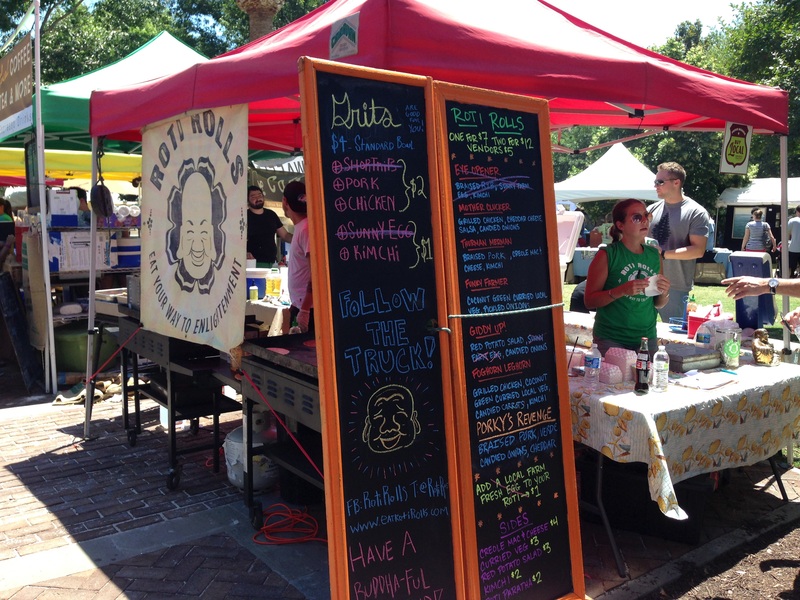 We started out our weekend with trip to the farmers market. The Spoletto Festival was going on so the market was particularly active. There were many art and craft booths set up as well. 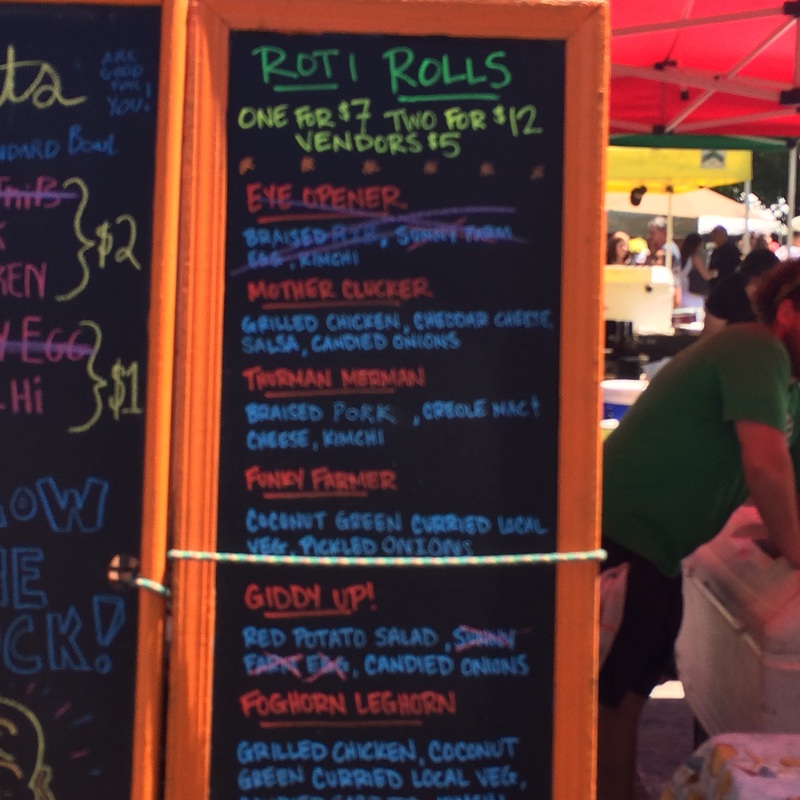 We headed straight to the Roti Roll food truck/tent. This has become a favorite stop for my wife! I got the Thurman Murman (braised pork, creole mac n cheese and kimchi) and my wife got the Mother Clucker (grilled chicken, cheddar cheese, salsa and candied onions)! A great way to start our amazing food adventure! After walking around the city for most of the day we met up with friends Lucia and Henry for dinner at a restaurant called The Grocery. The atmosphere was casual, but elegant at the same time. I was tempted to order one of everything on the menu but I settled on the Swordfish. It was great!! 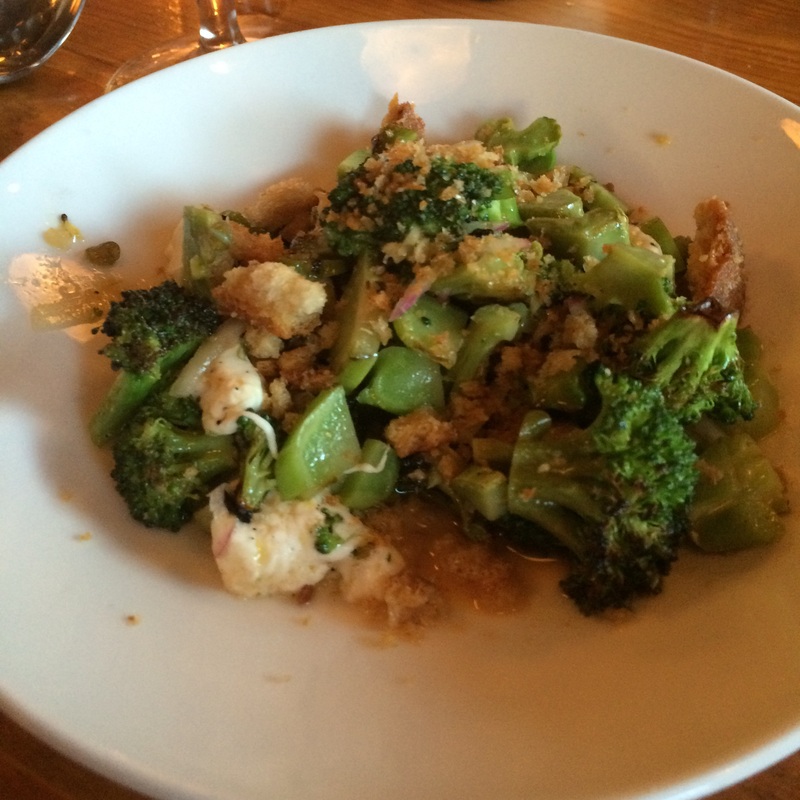 My wife had the Ramp Carbonara and a we shared a side of roasted broccoli, both were equally good! 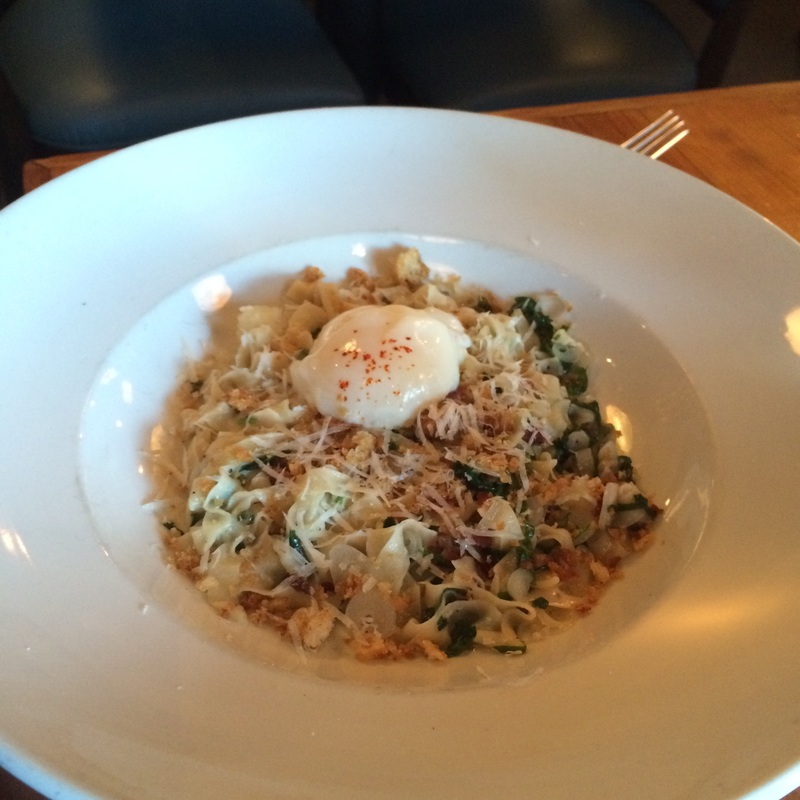 The Tagliatelle was fresh made pasta which is something I really love in a restaurant. If they take the time to make their own pasta, the food is usually fantastic. 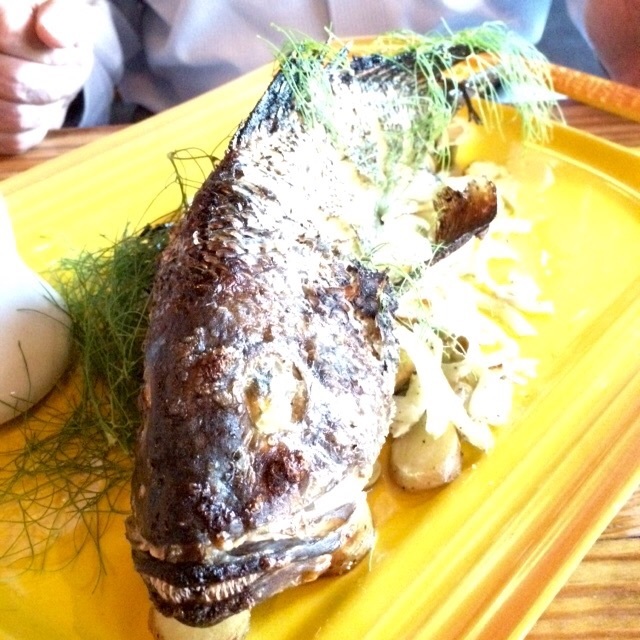 Although we thoroughly enjoyed our meals, the star of the show was the whole black bass that our friend “Hank” ordered! Based on the look of his plate after dinner, I’d say he enjoyed it!! After dinner we took a walk around the city and ended up stopping for an after dinner cocktail at the famous Charleston Grill at the Belmond Charleston Place. This place has a great atmosphere, Jazz music and fantastic service. 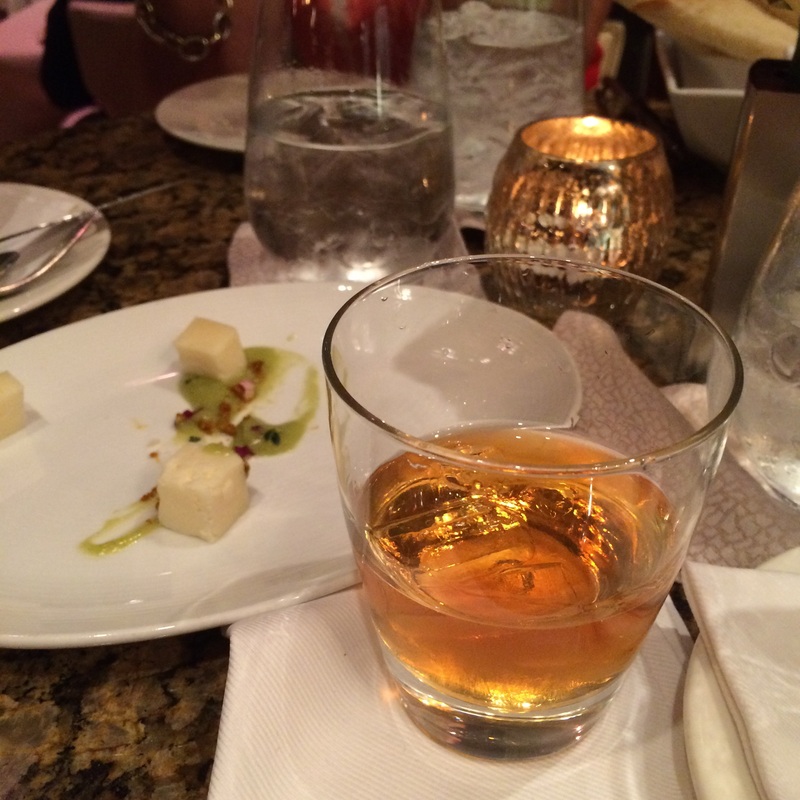 Henry and I ordered a cheese plate that paired very well with our Lagavulin Single Malt Scotch!! A great way to end the night! 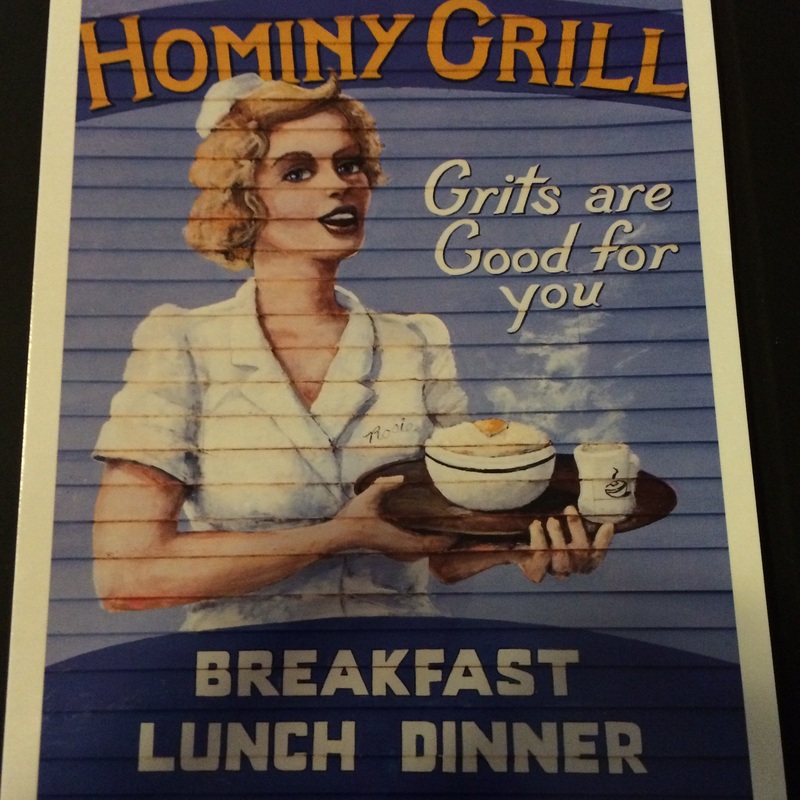 The next day we started our day off with a hearty breakfast at the Hominy Grill in the historic district of Charleston. We’ve heard about this place and were told to get their early as there is usually a line out the door waiting to get in. We only waited about 5 minutes, but this is what we saw on our way out the door after enjoying a fantastic breakfast. My wife had an amazing vegetable omelet and I had the most popular dish on the menu, the Charleston Nasty Biscuit, and now I know why it’s their most popular!! 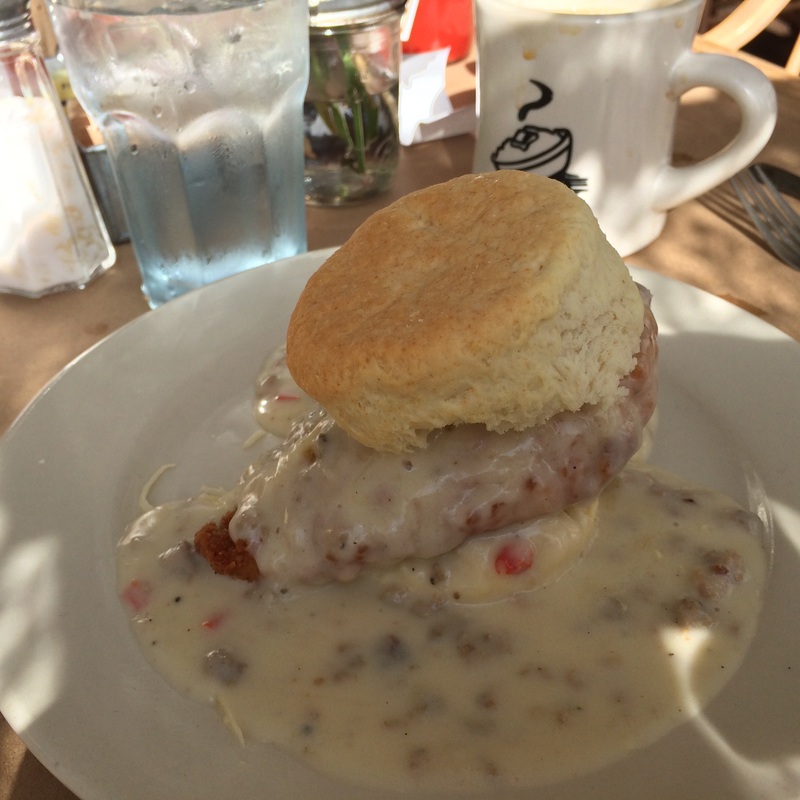 It’s a fried chicken biscuit smothered in sausage gravy! Yum! A little later in the day we drove over to Sullivan’s Island to catch some time at the beach. While walking towards the beach I pulled up Yelp to find out if there were any great restaurants on the island. It just so happened that less than two blocks away was The Obstinate Daughter! Both my wife and I had heard about this restaurant and although we weren’t hungry! We went in and ate!! In my family we have a saying, “Hunger is not a pre-requisite for eating!”. 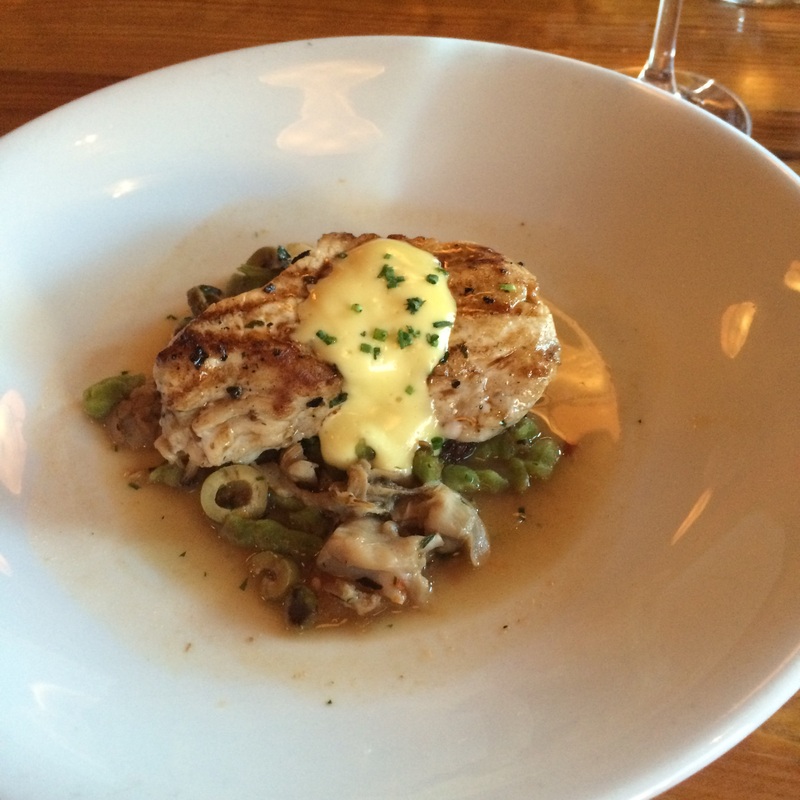 We just couldn’t pass up the chance to try this place and we don’t regret it! Our waitress Anne was fantastic and obviously loved her job. She was proud of the farm to table approach and the care the chef takes in selecting the best local ingredients. We started out with a plate of peel-n-eat shrimp and were both surprised by the delicious dipping sauce that came with it. 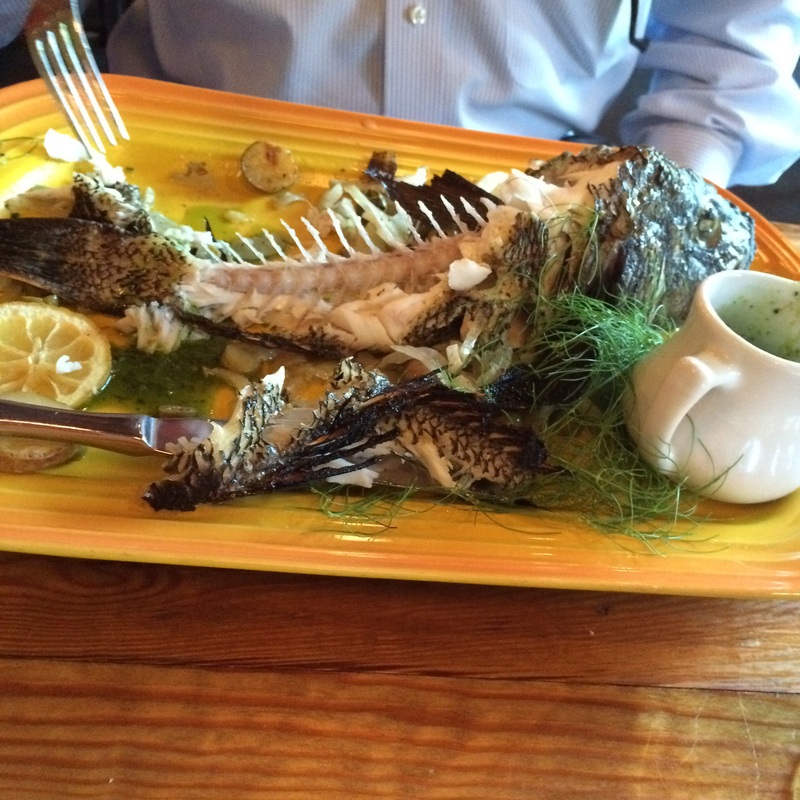 It was a green tomato aioli. We loved it so much, Anne agreed to send us the recipe. Look for this in a future blog post!! I will be making it soon! We split a bowl of the Frogmore Chowder. This chowder is so amazing it was recently featured in the Washington post!! We noticed the wood fired oven and could not pass up the chance to try their pizza! Both my wife and I have been limiting our bread consumption so this was truly a treat for both of us. 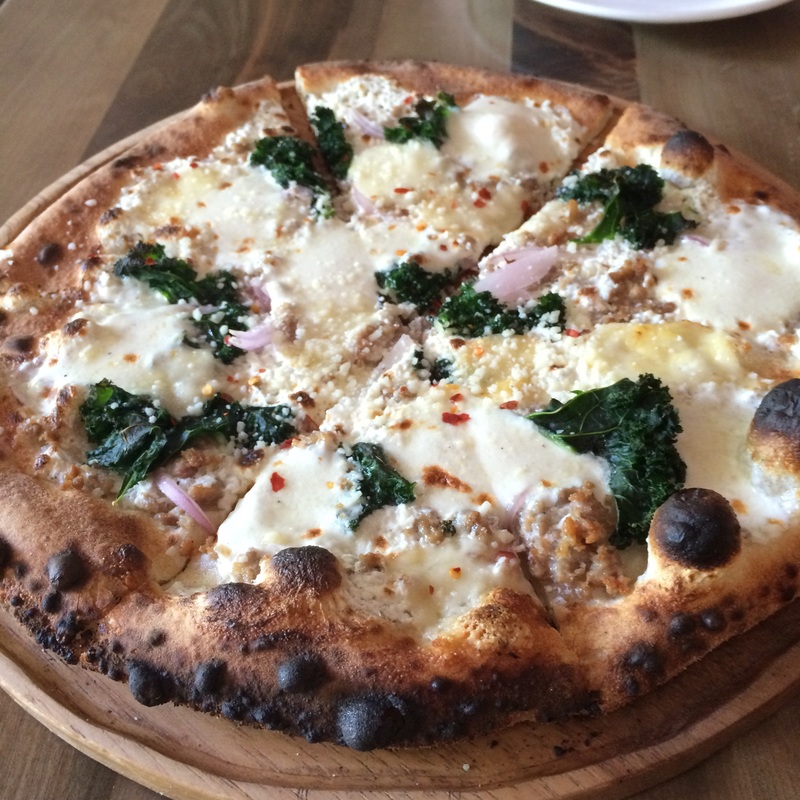 All of the pizza’s on the menu looked delicious but we settled on The Rutledge – ricotta, Italian sausage, red onion, local greens, mozzarella, provolone picante. It was delicious! The next morning we decided to find a breakfast restaurant downtown and eat before heading back home (of course!!). We found a place called Eli’s Table on Yelp that had great reviews. It is a casual setting with a courtyard that creates a great atmosphere. My wife had the Eli’s Breakfast which consisted of two scrambled eggs, bacon, breakfast potatoes and a biscuit. 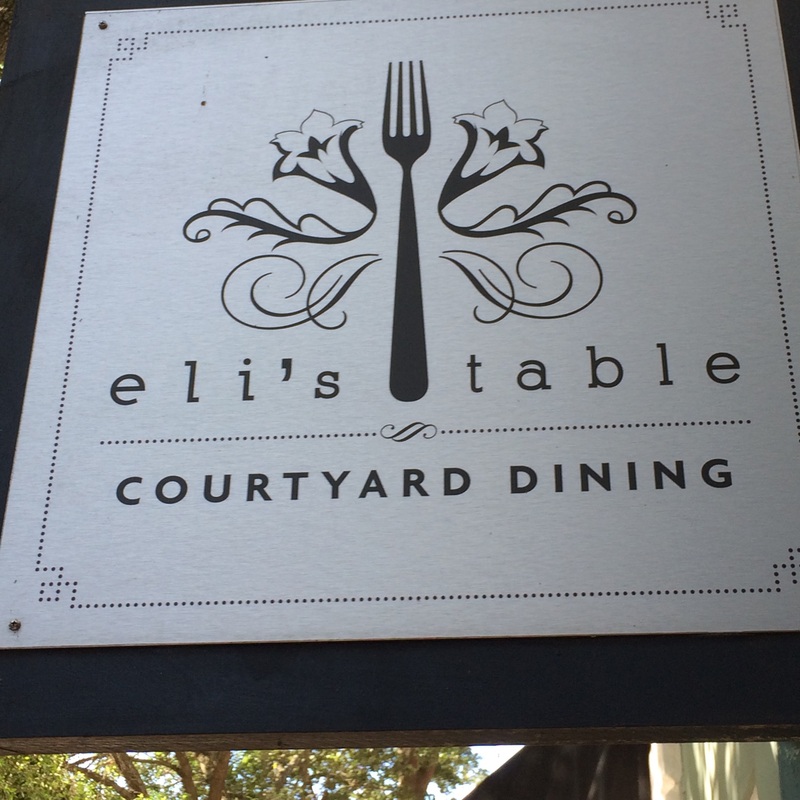 I have to say that after all the amazing food we had eaten this weekend, I especially enjoyed the Crab and Eggs at Eli’s Table. 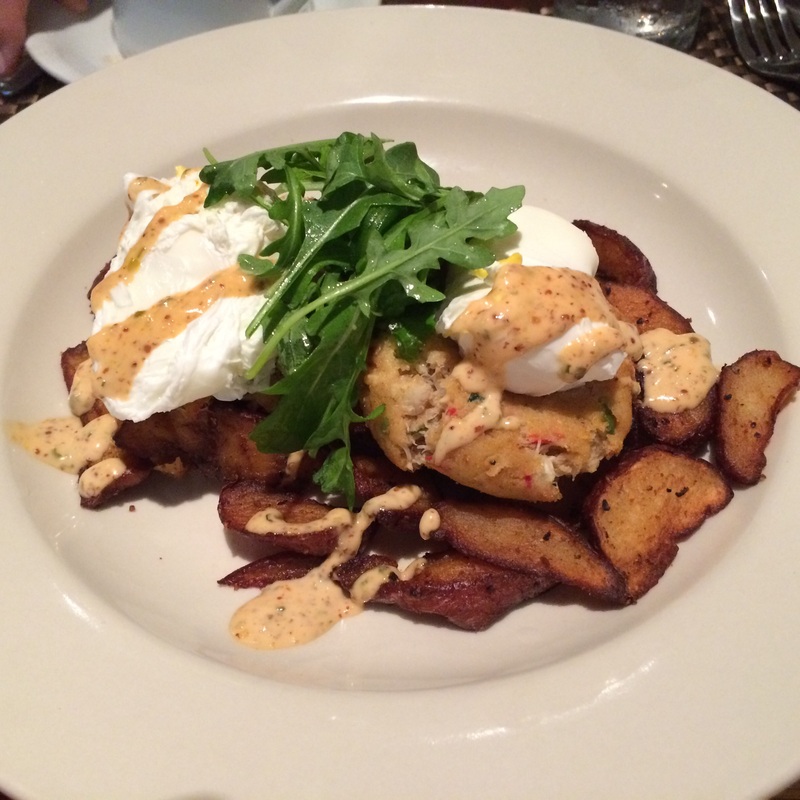 It is two southern fried crab cakes, two poached eggs, remoulade, arugula and breakfast potatoes. I can’t really say it’s the best thing I ate all weekend because they were all fantastic but it was one of the best breakfasts I’ve ever had! The service at Eli’s Table started out a little rocky as we sat for a while before being served. It turns out we were seated without a waitress being assigned and once she was assigned the service was fantastic. 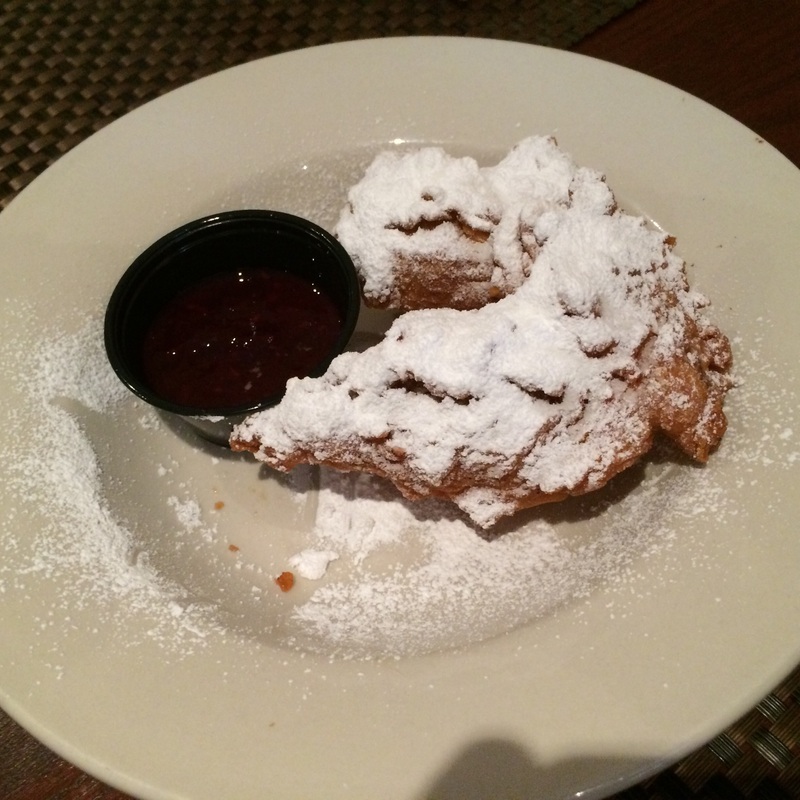 An honest mistake and after they realized they had us wait they made up for it by giving us complimentary Beignet with an amazing raspberry dipping sauce! A great way to top off the weekend with a little decadence! This trip to Charleston was a last-minute decision. I love ad-hoc trips that have no agenda. We made some great memories and had fun eating our way through Charleston!! Visit http://www.sundaywithachanceofmeatballs.com for some great recipes and stories! 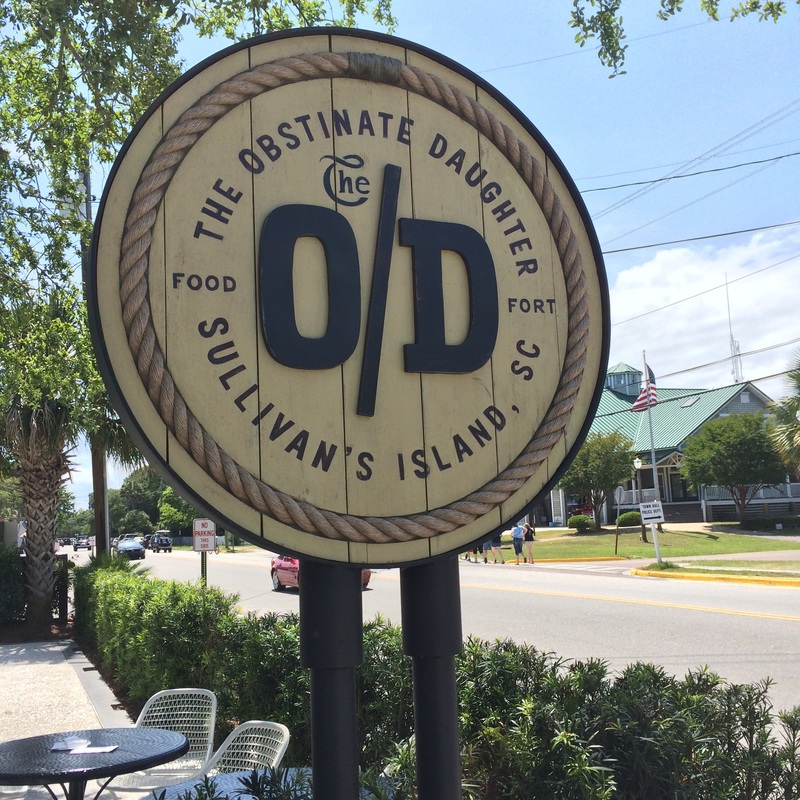 This entry was posted in Best thing I ever ate!, Travel and Restaurants and tagged charleston, culinary adventure in Charleston, restaurants in Charleston, sc, SC food scene. Bookmark the permalink.